Craft beer and quality songs go together like the yin and the yang. That's part of why I was so thrilled when those two things on my list of "top favorites ever" were paired so perfectly at the Microbrew & Music Festival in Traverse City over the weekend. 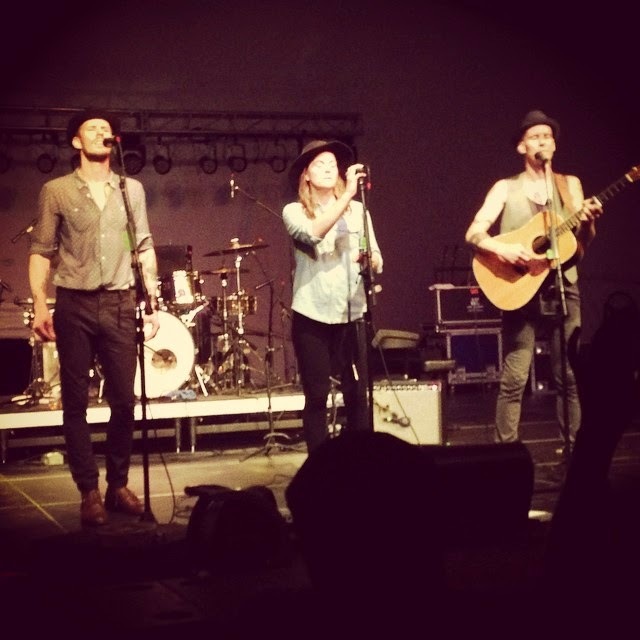 On the lush green campus of the Village at Grand Traverse Commons in Traverse City, surrounded by food trucks and beer tents, Brandi Carlile and her close-knit, talented band pulled friendly, tipsy fans into a night of joy-filled singalongs. Her music has inspired me and guided me out of the mud of life on occasions too numerous to count, and the show on Friday -- my fourth time seeing her perform -- was just another example that she's got a song for every emotion I feel. In that spirit, tonight I want to share a song-and-drink pairing list Brandi's music and the festival setting inspired me to "craft." It combines beer or cider served at the tents with songs played during the concert. I picked the pairings based on how the quality of the songs matches up with the flavor or description of the drinks. 1. "Keep Your Heart Young" + the Sun Cup Lemon Wheat beer from Brewery Terra Firma. I picked this beer to go with this song because they are both light-hearted and whimsical. 2. "Have You Ever" + the 45th Parallale from Brewery Ferment. Brandi opened the concert with this song, and it immediately struck me how apropos to Northern Michigan it was. Woods, starry skies and snow to boot. A day in the 45th Parallel sticks with you. 3. "Pride and Joy" + Cranberry Ginger Cider from Northern Natural Cider House. The baseline of this song is regret, but just like the flavor of a cranberry, it leaves the mind, body and heart feeling cathartically healed. 4. "Dreams" + Screamin' Pumpkin Ale from Griffin Claw Brewing Co. This song is a guilty pleasure. The beer is basically dessert. What more do I need to say? 5. "The Story" + Little Honey Ale from Brewery Terra Firma. This beer "tells you the story" of what I like in a brew. Heavy on the honey and coriander, light on the hops, bright and clean. If you're a Brandi Carlile fan and a beer fan and you want to give it a shot, I'd love to hear your pairing suggestions. Leave me a comment below or share it on my Facebook Community page.